Ask anyone which invention had the greatest impact on mankind and you’d probably get a mixed response. The wheel, gunpowder, the compass, the steam engine, electricity, sliced bread; take your pick. Me? I’d go with the printing press. Think about it. Over the history of civilisation, who has held the keys to social and economic power? Answer – the aristocracy, aided and abetted by the Church. In other words, those with access to education, culture and knowledge. 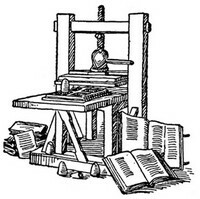 The printing press democratised education, culture and knowledge. Its contribution to spreading knowledge and learning destroyed the age of belief and blew apart the Church’s claim to a monopoly on knowledge. It paved the way for the Reformation, the Renaissance, Nationalism, the Scientific and Industrial Revolutions, and pretty much everything else we see around us today. So here’s the thing. If the printing press had such a profound effect on the advancement of mankind, what on earth is Social Media going to do to us? OK, so a single printing press in the 15th century could churn out 500 books in the time it took a scribe to write one. Those 500 books still needed to be distributed and consumed. Just 20 years ago the giant publishing houses controlled much of the printed word. Today it is truly democratised. Anyone with access to a computer and the internet can publish whatever they want in a matter of seconds. It is estimated today that there are around 1.4 million blogs in blogosphere, and around 900,000 million blog posts are published every day. Facebook has 500 million active users, who share over 30 billion pieces of content every month. Twitter has 100 million registered users and is growing at the rate of 300,000 per day, with 55 million tweets a day. 24 hours of video is uploaded to YouTube every minute, while the site enjoys 2 billion views per day. I could go on but I think you get my drift. But before we get carried away on the tidal wave of social media euphoria, hold onto this thought. If you spit in someone’s face you’ll get their undivided attention. If you spit into the middle of the Pacific Ocean no one will ever know. The power now resides with those who can help us navigate through all of this stuff.